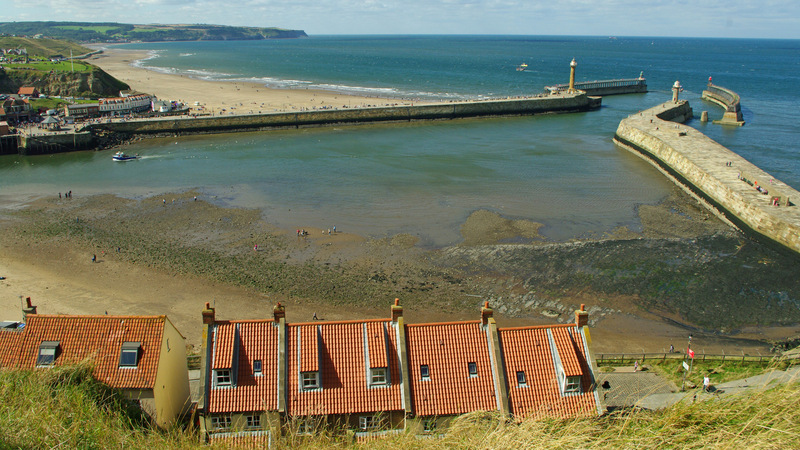 Whitby in the north of England is a real seaside gem. 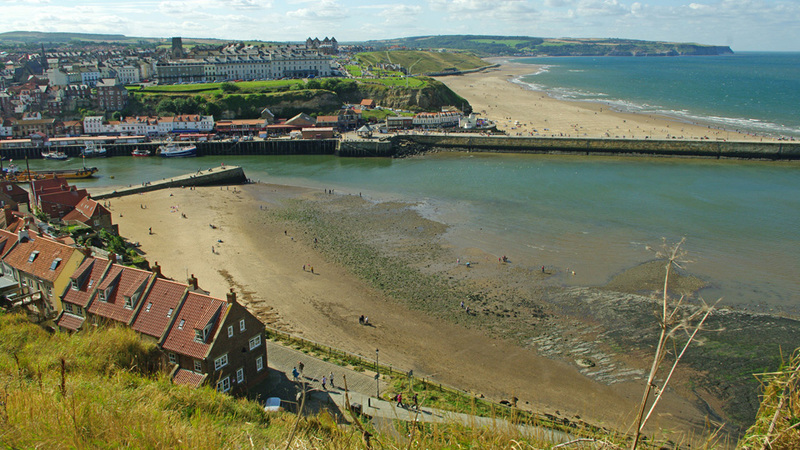 England has many seaside towns which became popular holiday destinations for ordinary people beginning in Victorian times with the growth of the railways. The town has managed to buck the trend for decline in some such resorts due to a combination of location and being very picturesque with a long and varied history and variety of activities to do within the town and nearby. 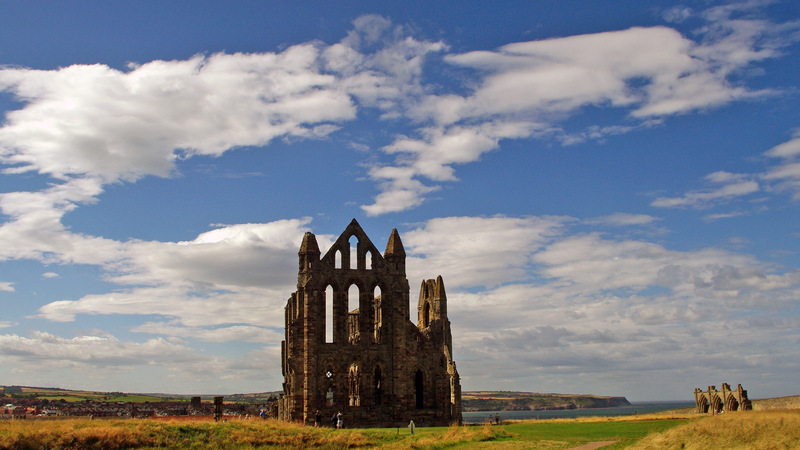 Rising above the town on a cliff top there are the famous Abbey ruins which inspired Bram Stoker to write "Dracula". 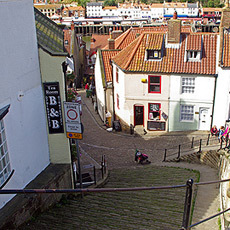 Leading to the Abbey is a flight of 199 wide steps that rise from the cobbled streets of the old town and past houses built on the hillside to give a fabulous view of the town, harbour and coastline. The town has a busy marina, a number of boat trips are available lasting from an hour to several hours. 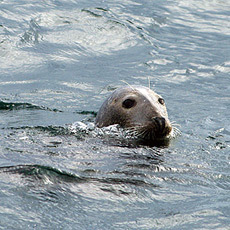 There are even whale watching trips to see minke whales and seals offshore that feed on fish shoals. 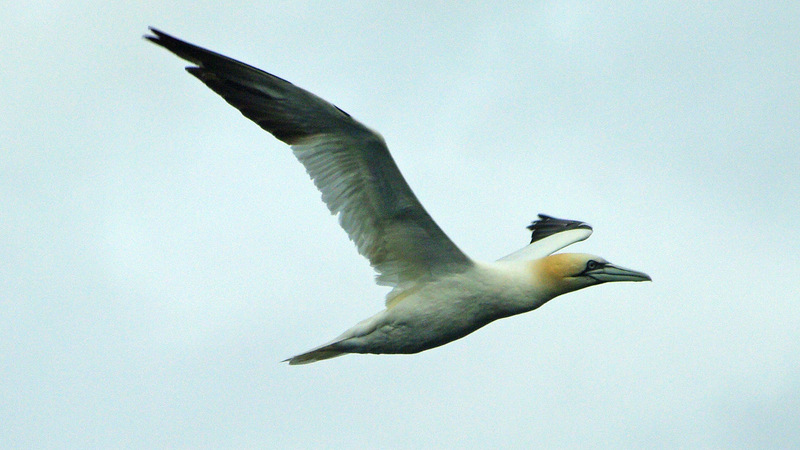 Dolphins, porpoises and other whale species may join in too if you're lucky. 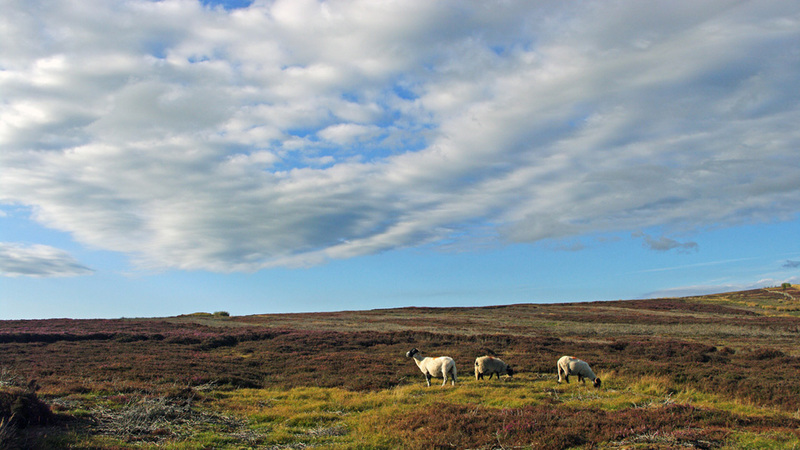 Not too far afield are the beautiful North York Moors national park, and other towns and villages such as the must-visit Robin Hood's Bay. 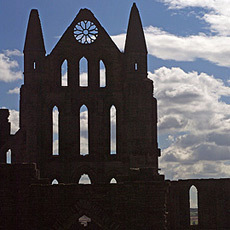 656 - Earliest record of a settlement, first Abbey erected. 1078 - First use of the name Whitby, remains a small fishing community for several centuries. 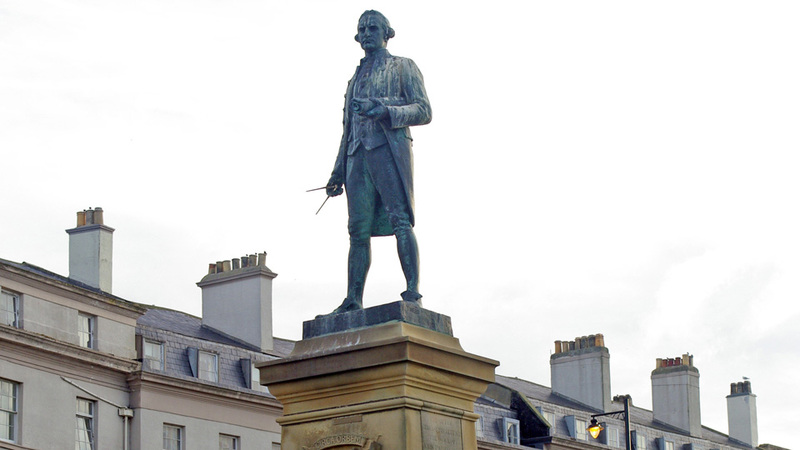 18th Century - Becomes a shipbuilding and whaling center with an active port. Locally mined alum and jet are traded. 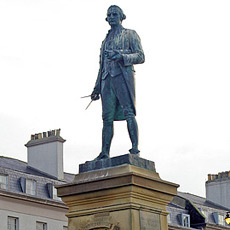 1764 - The Endeavour captained by Cook on his voyage to Australia is built at Whitby. 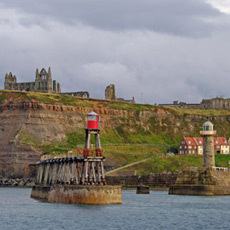 Georgian times - 1714-1830 - Whitby develops as a Spa Town. 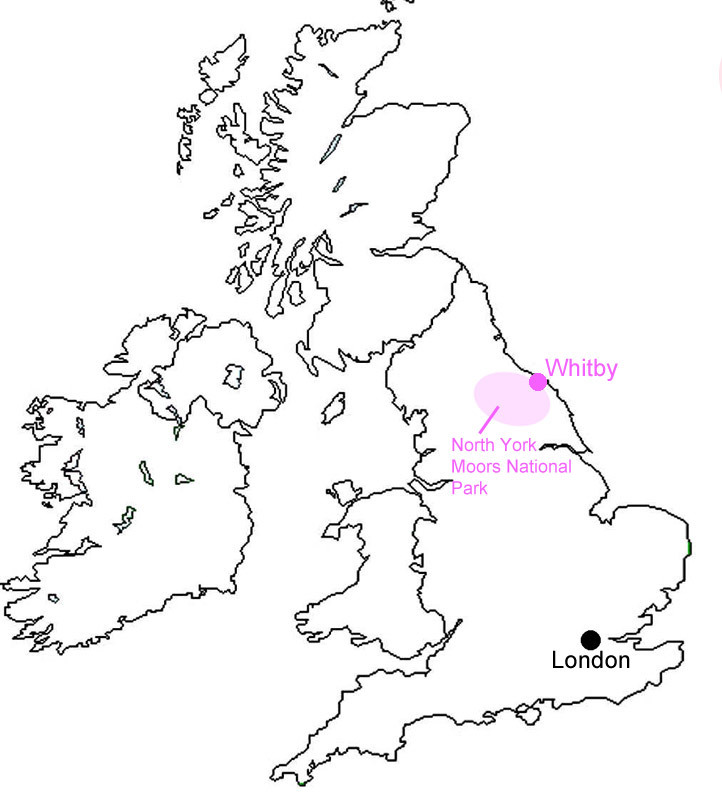 1839 - The railway reaches Whitby and contributes to the town's tourism development. 1914 - Abbey sustains considerable damage after being shelled by German battleships (aiming elsewhere). Have fish and chips and eat them while looking out to sea - This is something that applies whenever you are at the sea-side, it makes the whole eating experience more pleasurable. 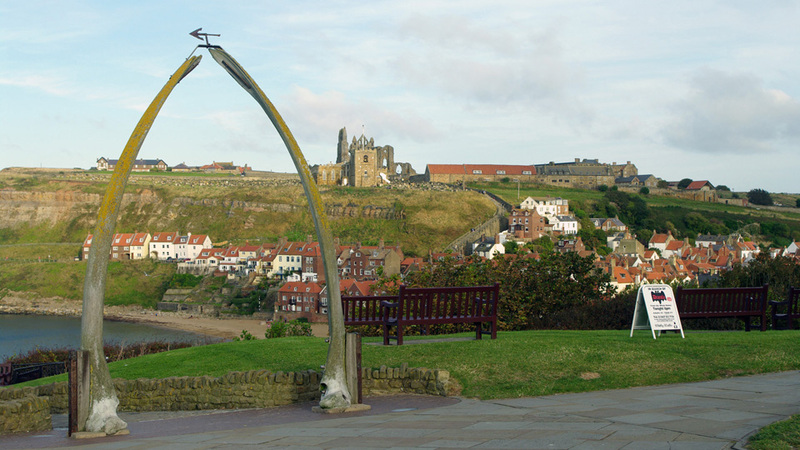 The Magpie Cafe is the most famous fish and chip bar in Whitby but by no means the only one and others are of a high standard too. You can eat in or take out.. 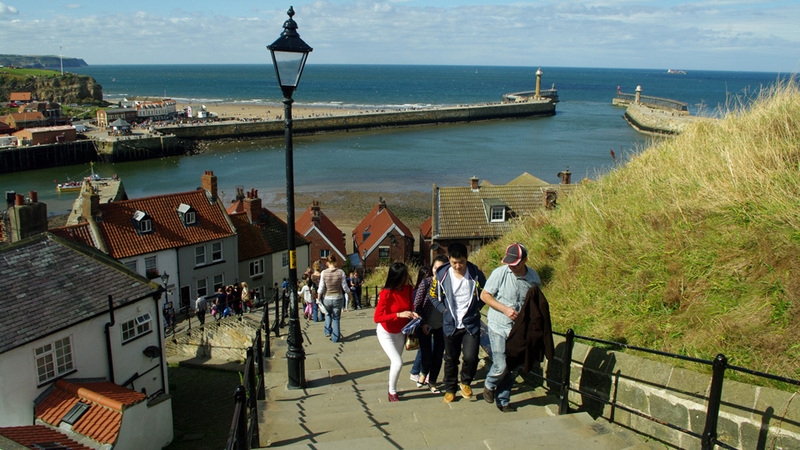 Walk up the 199 steps and visit the Abbey - Tradition dictates that you should count the steps as you climb, I only heard this after the event however and I'm happy to trust others who say they've counted 199. 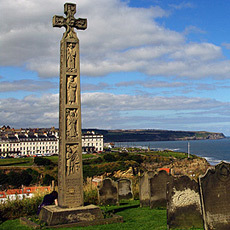 They lead from the eclectic mix of shops in the old town up to the Abbey ruins, church and graveyard on the East Cliff. 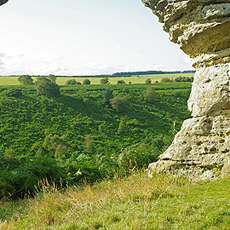 The Abbey grounds and visitor center are run by English Heritage with an entry fee, though there is plenty to see and free walks with great views regardless. You can also visit the 11th century St. Marty's church. 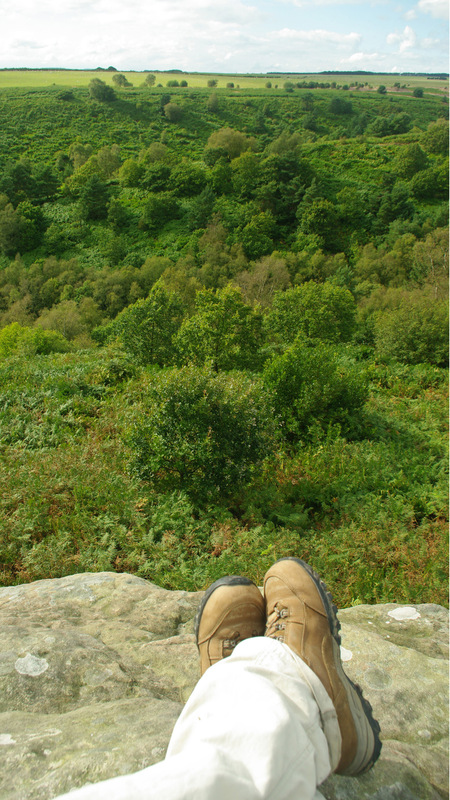 It is possible to drive up if you can't or don't want to tackle the steps. 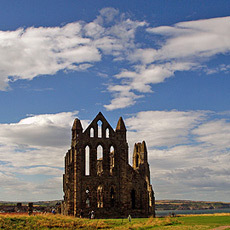 In Bram Stoker's "Dracula", the Count leapt ashore from the grounded Russian schooner the "Demeter" in the form of a huge black dog and ran up the 199 steps towards the Abbey, leaving behind a crew that were all dead and the captain lashed to the wheel. Walk around the harbour - Go crabbing from the harbour wall using bacon fat as bait, explore the myriad of shops in and around the harbour area, walk out as far as you feel like along the harbour walls to the lighthouse (£1.50 entry). Walk / play on the beach - a large beach which becomes huge at low tide. Great for kids making sandcastles or to walk the dog (October to May on the west beach, all year round on the east beach) it is North Yorkshire however and the North Sea, so don't rely on sunbathing or swimming in the sea here most of the time unless you like it on the "bracing" side. 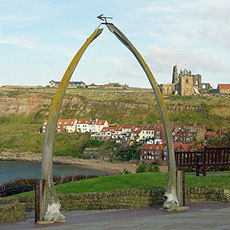 Whitby Museum - In the middle of Pannett Park centrally placed in town. 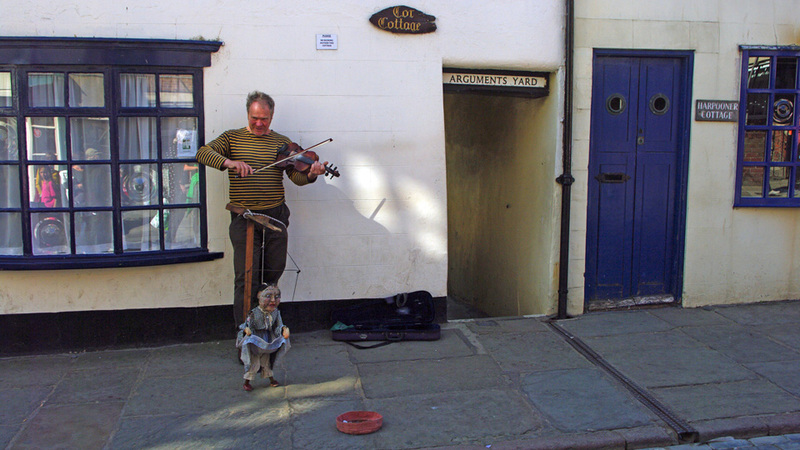 If you like museums at all you'll love this place, the theme is "some sort of connection to Whitby" and is an eclectic pot-pourri of all sorts of fascinating stuff. 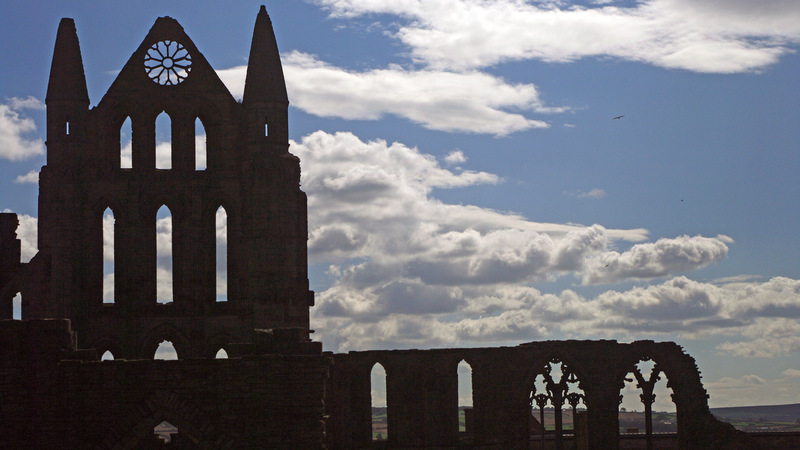 It deserves more than one visit which is just as well as the £5 entry ticket allows you repeat visits for a year. 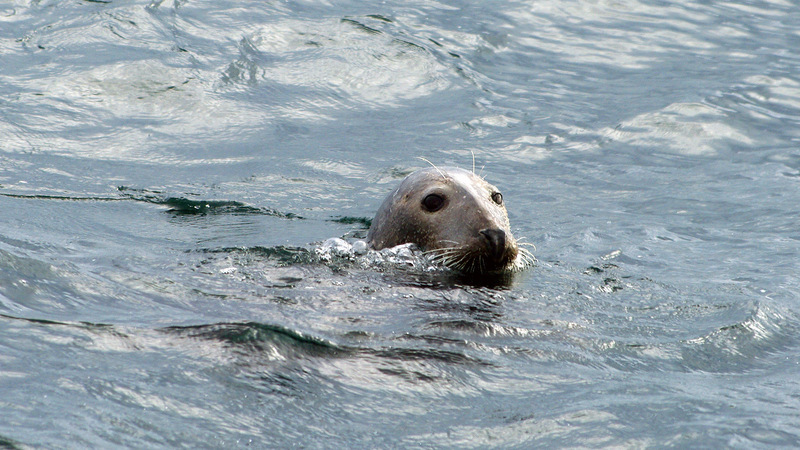 Go on a boat trip - There are a number of boat trips leaving from the harbour going out to sea or up the river from £3 for adults and free for under 5's. Choose from an old lifeboat, the "Captain Cook Experience" or more conventional craft, longer trips are available including fishing trips. 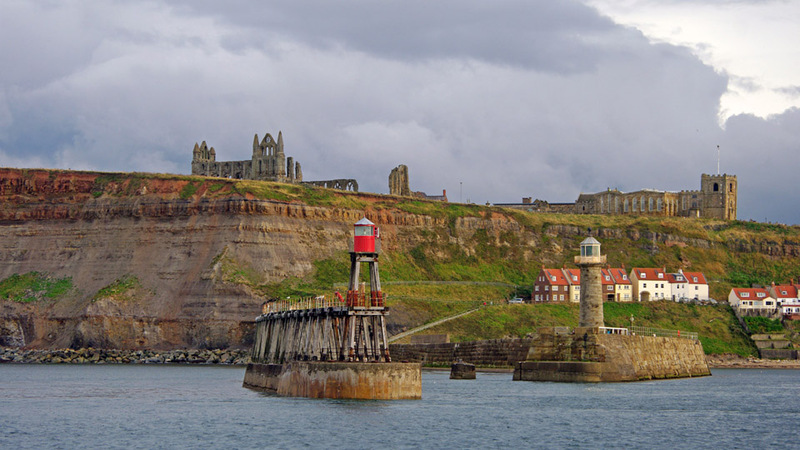 Going on boats for their own sake is worth the effort alone, the view of Whitby from seawards makes it more than worth it. Fossil hunt on the beach below the east cliffs at low tide - Fossil ammonites, shells and reptiles as well as pieces of jet, the fossilized resin of monkey puzzle trees used for making jewellery, can be found for about 3-4 hours around low tide. 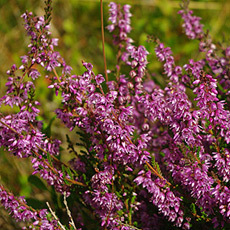 The area is designated as a SSSI, a site of special scientific interest. The best time is following winter storms when new material is exposed. It's not suitable for small or unsupervised children and make sure you don't get cut off by the tide which goes right up to the cliff base. 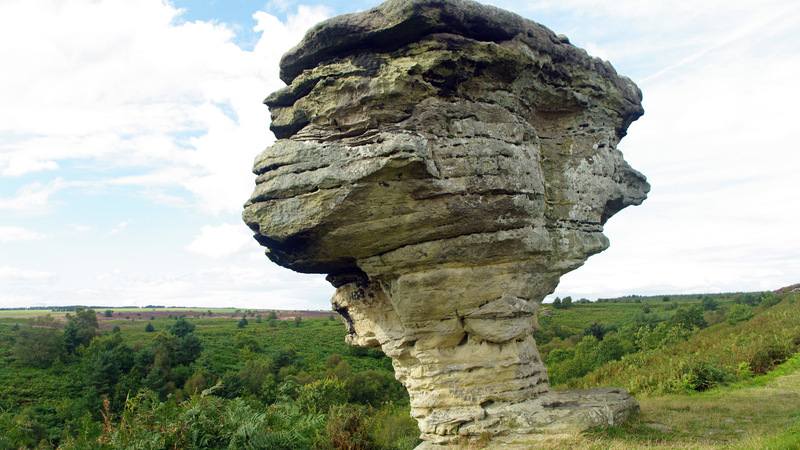 There are sometimes guided walks, look for announcements of these in the local fossil and gemstones shops. 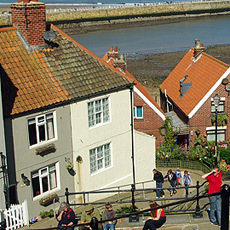 Robin Hood's Bay - A village as well as a bay, about 7 miles from Whitby, if you're feeling energetic you can walk there and return to Whitby again by bus (the X93 every half an hour or so - timetable). 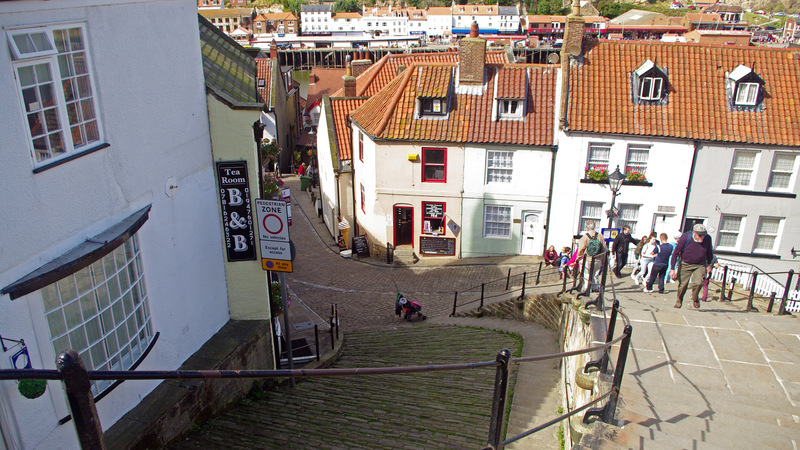 A lovely picturesque place with cobblestone streets and a very steep road down into the village from the pay and display car park at the top of the hill. Don't try taking your car down into the village if you're visiting, the roads are very narrow and there is virtually no other parking. Lots of interesting little shops, pubs and cafes to sit and watch the world go by from and a nice little beach too. Allow 2-4 hours. 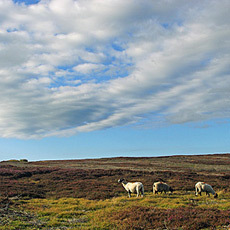 North York Moors National Park - Surrounding Whitby and somewhere you should make the effort to get out and see. 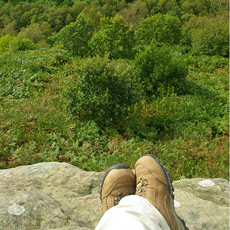 There are many walks you can take of various lengths and difficulty. 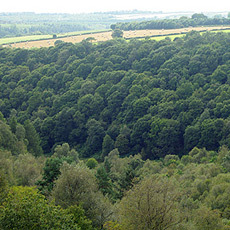 Dalby Forest and the walk to the Low Bride Stones from the car park is within easy reach by car. 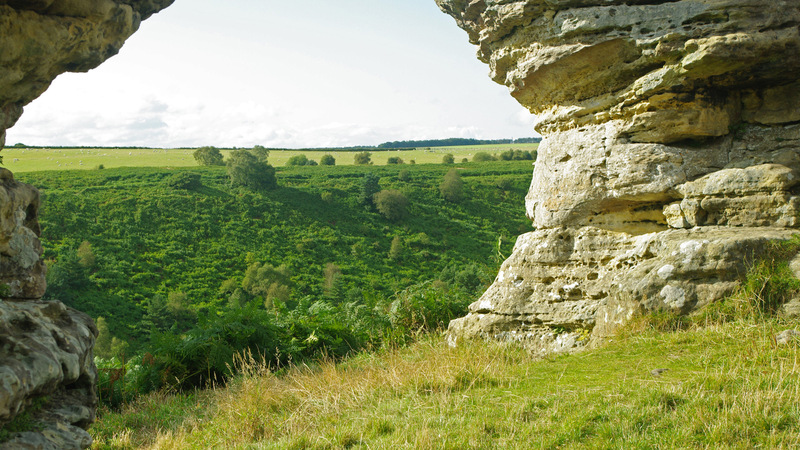 Scarborough Castle - Explore the castle and picnic in the grounds, pay to enter and part of English Heritage, the current castle ruins date from the 12th century, but the history of settlement on the headland where the castle stands goes back about 3,000 years. 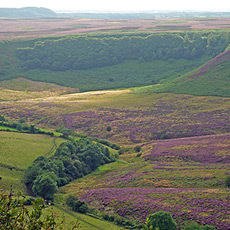 About 20 miles from Whitby. 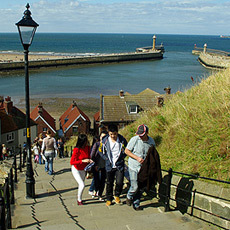 Whitby ties in well with a visit to York, you can spend a day or two here or longer for a relaxing break. The train is quite slow as it wanders a bit (though no changes needed), the journey is quicker by car. 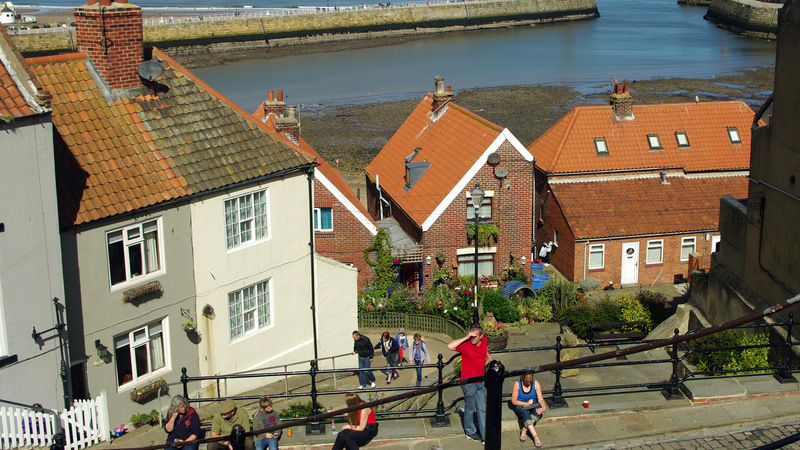 At the right time of year, you can make the journey between York and Whitby by steam train. Rail - From York in 2-3 hours, about 5 hours from London. 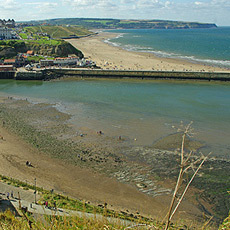 The station is central in Whitby. 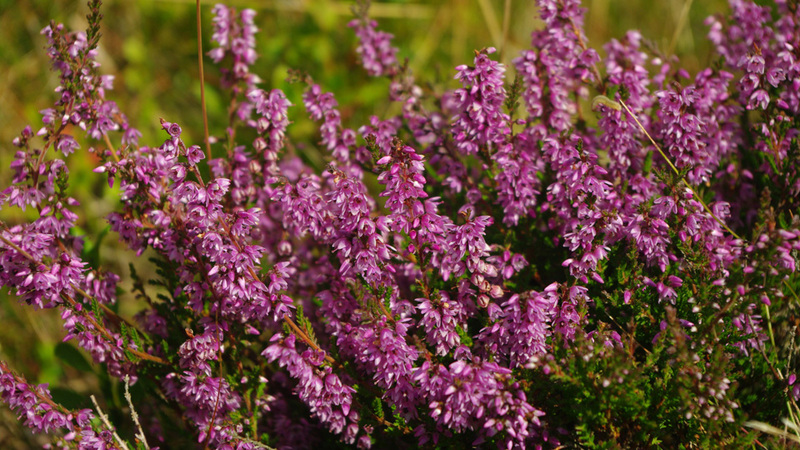 Road - From the south up the M1, join the A1 at Doncaster, then take the A64 via York. 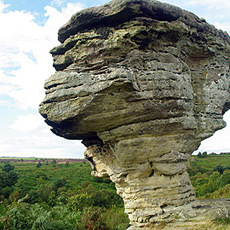 About 80 minutes from York, 4.5-6 hours from London. 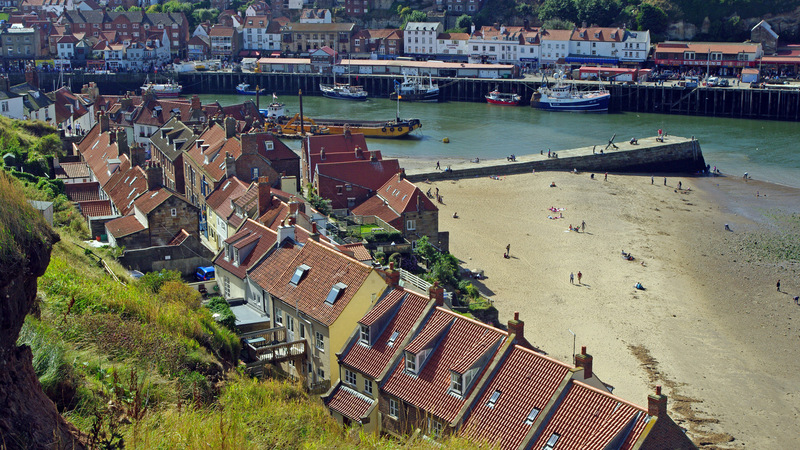 Very picturesque, regularly included in lists of England's most beautiful small towns. 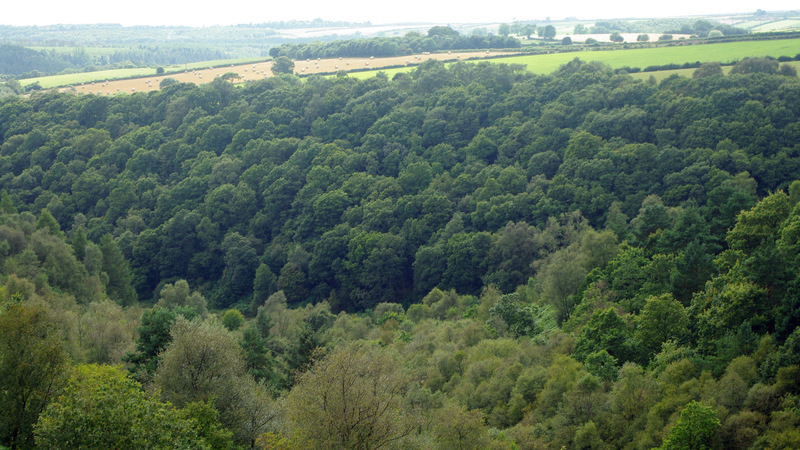 Nestled into the valley of the river Esk where it meets the sea. 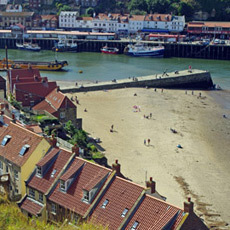 Atmospheric with winding cobbled streets, a working harbour and marina, old buildings, cliffs with a ruined Abbey and ancient but still used church on the hill. Easy to get around the town on foot, all the main sights and activities are easily reached while walking. 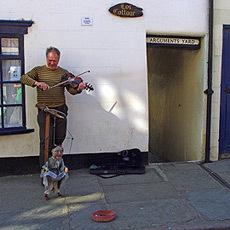 Great shopping in a wide range of esoteric small shops and galleries. 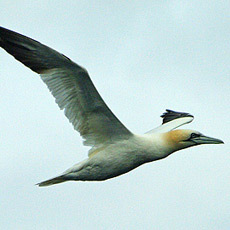 A choice of boat trips, including child friendly, fishing trips and whale watching. Family friendly, there is something for the whole family here without being too biased towards any particular age group. 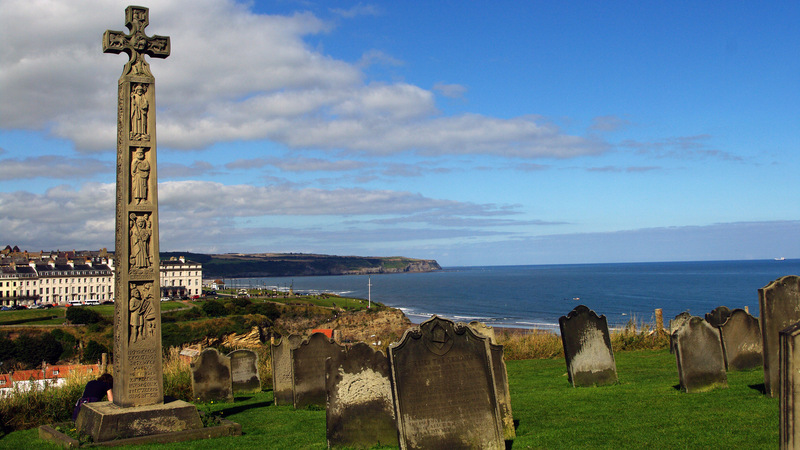 Provided Bram Stoker with the inspiration to write "Dracula", the town appears in the book (as itself). 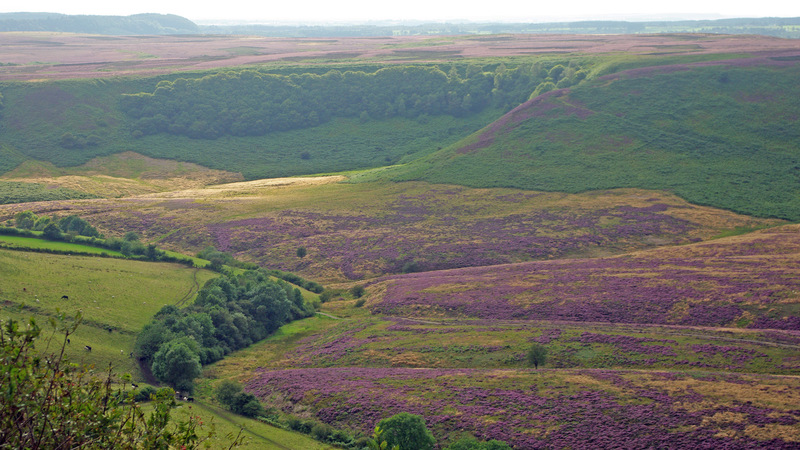 On the edge of the North York Moors National Park, easy access to beautiful surrounding countryside. 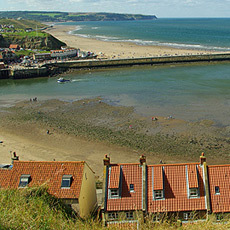 North Yorkshire and the North Sea mean that the weather isn't conducive to sunbathing and swimming in the sea. People do it, but you won't be troubled by crowds.